The Conceit Beneath It All! “The following was posted in the comments section here but was SO good I thought deserved being published as a stand-alone. Our great thanks to the good Sgt. most of our government and media would be shot for treason or sent off to a FEMA camp or put to work on infrastructure projects. AIPAC and the Rothschild’s Federal Reserve would be no more. The debt would be erased over night. Lobbies and all political donations outlawed. MOSSAD agents in America would be shot on sight. And if Israel didn’t like it, some of our 81 nuclear attack subs and 11 carriers would finally be put to good use. John Hagee would simply be put on a starvation diet. Pam Gellar sent to a concubinage in Saudi Arabia. Alan Dershowitz & Joe Lieberman parachuted into Afghanistan wearing IDF officer’s uniforms and MOSSAD ID. George Bush and Donald Rumsfeld taken to Nevada and tied feet-first to wild stallions. Glen Beck and Rush Limbaugh cast adrift on a life raft in the western Atlantic at 20 degrees north in the middle of Hurricane season. The entire lot of neo-cons involved in 9-11 would be loaded onto a remote control jet with just enough fuel to make it 500 miles off the east coast at 30,000?. These are only a few of the just ends for the traitorous agents of Israel. This country would be cleaned up in short order. In the day-to-day events in the Middle-East massive physical-changes have been underway to finally begin the needed shift in global-positioning which has been AWOL since the end of the Second World War. 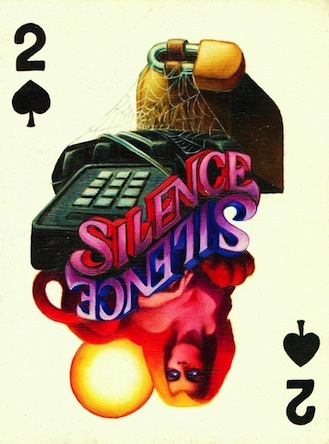 All of it has been long overdue and hidden in so many different forms of silence, that it’s been very difficult for anyone to understand. At the end of the First World War, the same barbarians that are still calling the shots began this chapter of history by rearranging the borders of nation-states and peoples, to fit what they perceived was needed, to control and kill a third of the world at that time. This troublesome part of the planet was controlled by the Muslim World of that day. After WWII, and with the artificial creation of the UN, the world launched an entirely new way to deal with people with nationalities and religions so that differences could be easily erased and surrendered to the growing global powers who designed everything we face today. This began with giving nation-state status to a people that had not created their own place in the world, in the normal way. The new country was called Israel. The population that would benefit would be the new-Israeli’s. This process began in 1945 and became a fact in 1948 when the UN recognized Israel as a state that could remove Palestine from its history thru a United Nations consent decree. That triggered the first war for the final creation of Israel. After that war, Palestine became a captive nation whose captured people were supposedly going to be protected by Israel. That protection, guaranteed by international-law, became a license-to torture, steal and murder Palestinians. 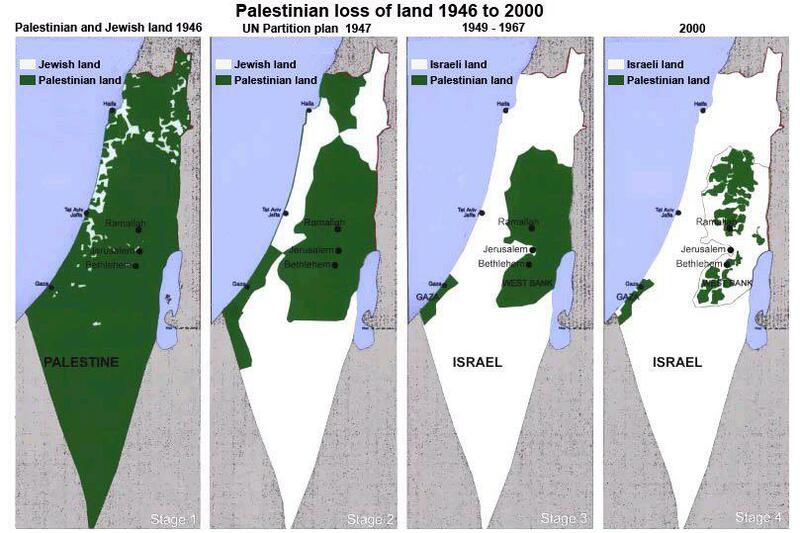 Israel illegally began to absorb all the lands that had been Palestine, until the UN dissolved their ownership and gave Palestine outright to Israel. Despite the obscenity, shown above, the Palestinians refused to leave and it is this continuing problem that created the world’s longest running genocide in modern history. The 1967 War that was going to change everything, and begin the new-Israeli expansion throughout the Middle-East also failed. Israel lost again and again, but succeeded only in stealing the Golan Heights from Syria which set-up the current designs which Israel is now demanding from Syria, Iran, Lebanon, Jordan, Iraq, and will later include parts of Egypt, Kuwait, Saudi-Arabia and Turkey. The red lines above are not just lines on the global map! When you look at the enlargement of the area in the Google link above a number of critical things will become apparent. What Israel is demanding is the total control of the Nile in Egypt, including Cairo. Total control of the Suez Canal, half of the Red Sea, all of Lebanon, and over half of Syria. This would give Israel the Eastern third of the Mediterranean and total control over the Mediterranean from Cairo to Southern Turkey. Israel already claims a 200 mile extension of their own coastline into the Med. But a completed-overreach (inside the red-line above) would grant Israel full control over shipping and the movement of resources throughout Egypt, including the Nile River basin which would include the Aswan Damn. 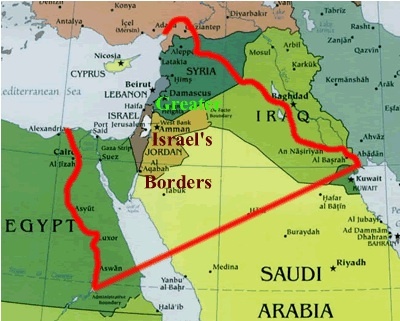 On the Eastern side; “Greater Israel” would own Iran’s southern access to the Persian Gulf, combined with Kuwait’s current port facilities, in the Gulf. This would turn Israel into the sole-hub for their global-center of absolute Israeli-control over the whole Middle-East. This is why they have been denied every time they have tried to steal more land, to make their criminal-enterprise into a reality. Among other things this is also why Russia and China as well as the BRIC states have come together to stop this global-piracy from ever taking place. The United States Marine Corp was created to end Piracy on the high seas. If “The Greater State of Israel” is not stopped; this global-theft of the entire Middle-East will make the history of global piracy shrink by comparison. This global-heist must be stopped dead in its tracks: Before Zionist Israel can take another step toward this nightmare for the rest of the planet. One of the most overlooked facts in all of this is that Israel is a totally failed-state when it comes to military expeditions. Israel can only win against unarmed civilians, and with the backing of US military assistance—because on their own Israel is nothing but a loud-mouthed imposter, a global-fraud and the total enemy of all mankind.